Look at this awesome bike rack I saw in Austin. 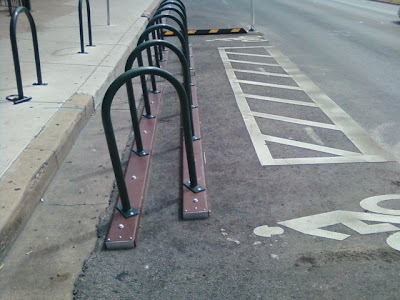 Maybe the city could replace some of their temporary street bike racks with more permeant ones like these. On a related note, I went to Back to the Bricks in Flint last night. While celebrations of the automobile are cool and everything, wouldn't it be cooler to have a bicycle festival? People would bring out their bikes and park them all up and down Main Street. People would meander up and down the street trading tips on bike repair and snapping pictures of sweet bikes. Think about. Probably a little more practical in Austin where more people ride year round. I love the idea of the temporary bike racks, but never see them very full. Adding a few more racks on the sidewalk would probably do more to help the situation. I agree we could use more sidewalk bike racks. As a year-round rider, I have had trouble finding a place to lock my bike downtown several times during the winter.